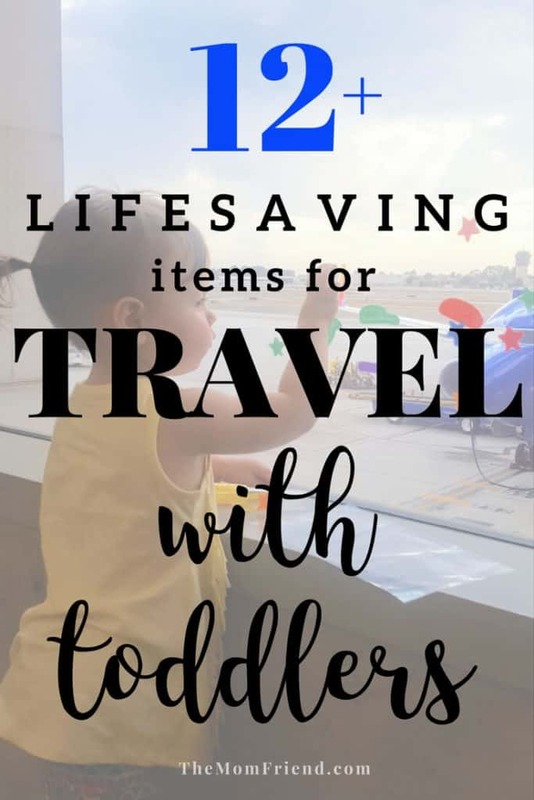 Travel is one of our favorite things to do over here, but let’s face it—traveling with a toddler in tow can be tiring on the best of days, and excruciating on the worst. 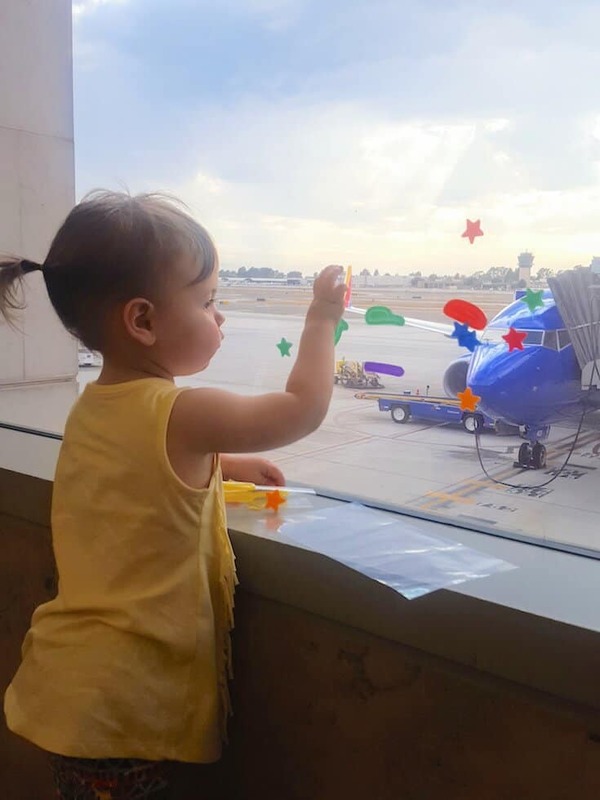 It’s funny how so many parents I meet talk about how nervous they were to fly with a new baby, but how after entering toddlerhood they realized that was actually the easiest time to do so! 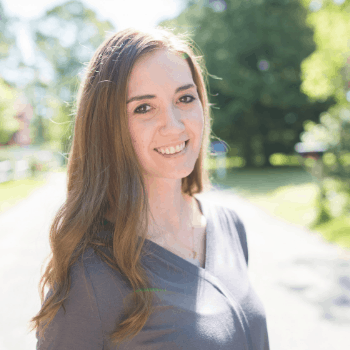 I simply nod my head in agreement—I went through the same experience. 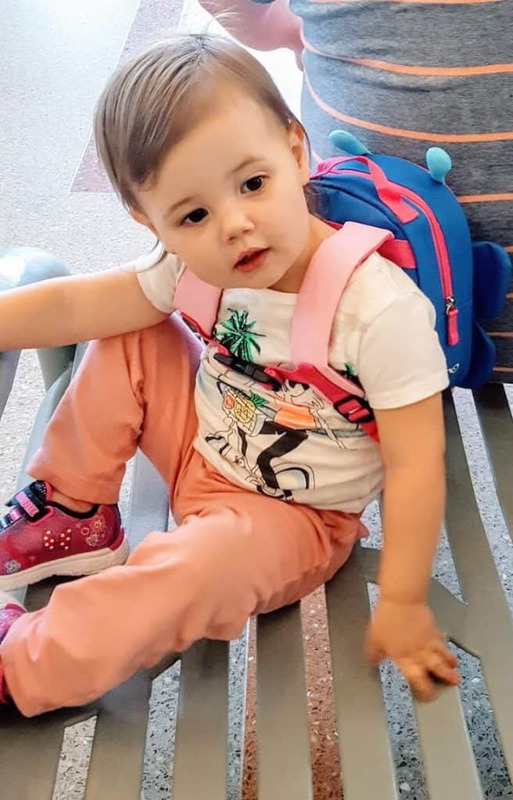 Some toddlers are great travelers, some have a hard time sitting still for more than 5 minutes, and many are a combination of both depending on the day and their mood. The fact that toddlers are a curious and energetic bunch trying to make sense of the world around them means every child will be different, and every trip might also be. 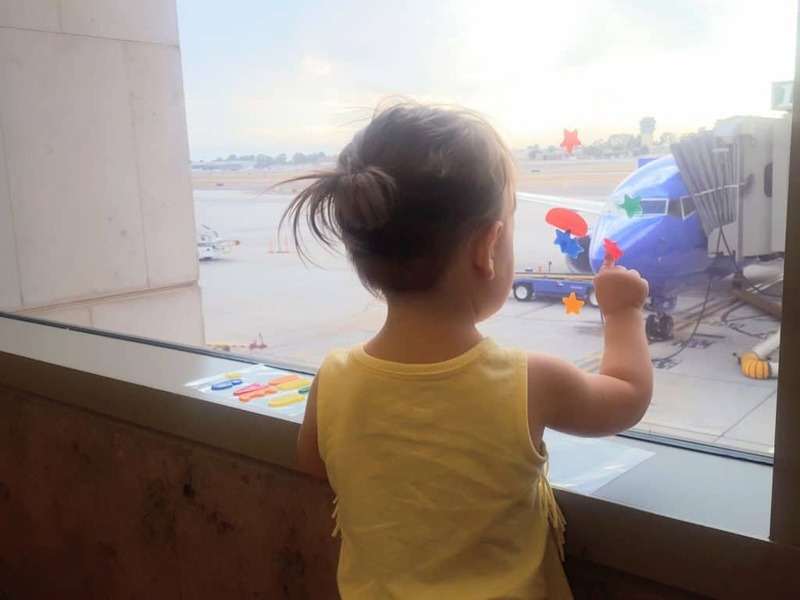 Charlie has had her fair share of flights and car trips as a toddler, and they have ranged from perfectly fine and content, enjoying the experience, to an all-out tantrum when I wouldn’t let her spend the entire flight on the floor of the airplane or trying to escape while in line for security. 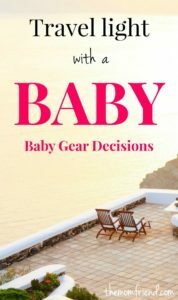 What I have found though is that the better prepared you are—both mentally and gear-wise—the more smoothly any trip will be. 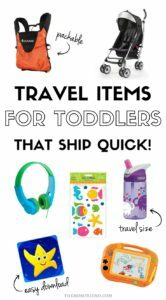 So today I’m sharing some of my favorite gear and travel items that make travel with toddlers much easier. Enjoy! Gel Clings are a toddler’s dream. They get to be creative, messy, and play, and they are a mom’s dream because they are so easy to clean up. The dollar spot at Target is great for gel clings, especially around holidays, so I always stock up when I see them. If you are in a pinch, I’ve ordered packs off Amazon as well, like these ones. It has a main zippered compartment that can fit a sippy cup, a doll, and a lovey. There is also a mesh bottle pocket on the outside. I chose this one specifically because I liked the option of the safety harness since Charlie is a sprinter. I ended up just putting a hand on the top handle if needed. They also make a larger version without the safety harness if that is preferred. Stickers make for great distractions. This one set of reusable puffy stickers from Melissa and Doug lasted us an entire week’s vacation, including cross-country flights, and was by far Charlie’s favorite travel item. I found she played with puffy stickers longer each time than flat ones since they would not tear and she could manage them better. These sets (available in a variety of themes) also have a double sided background for a literal change of scenery! Tablets are a great way to pass the time, whether it be with episodes of favorites like Mickey Mouse Clubhouse, educational apps, or movies. We pulled it out when she was starting to get tired but having a hard time sleeping (after putting her in her sleepsack—the perfect travel blanket), and it helped her relax a bit and avoid a meltdown. After trying other kid’s headphones, these from CozyPhone are my favorite. 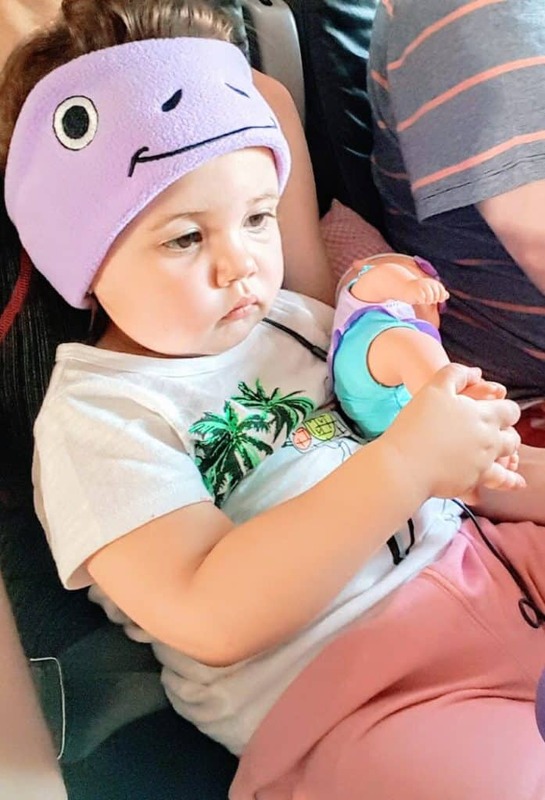 The soft fleece material is extremely comfortable to wear, and my daughter left them on for longer than any other pair I have tried (her pair is the purple froggy). Of course, she didn’t keep them on the entire time (and mostly just watched without the sound) but one aspect I loved was that when they were on, they stayed on! There was no major adjusting or trying to reposition them after she moved around, and the fleece was very comfortable against my chest since she spent the majority of a recent flight in my lap. I also like that the cord comes out of the back so it is easier to hide from her (less tugging and distractions). I really like this case for kid’s tablets—it stands up easily without needing mom to adjust and the arms serve as little handles. 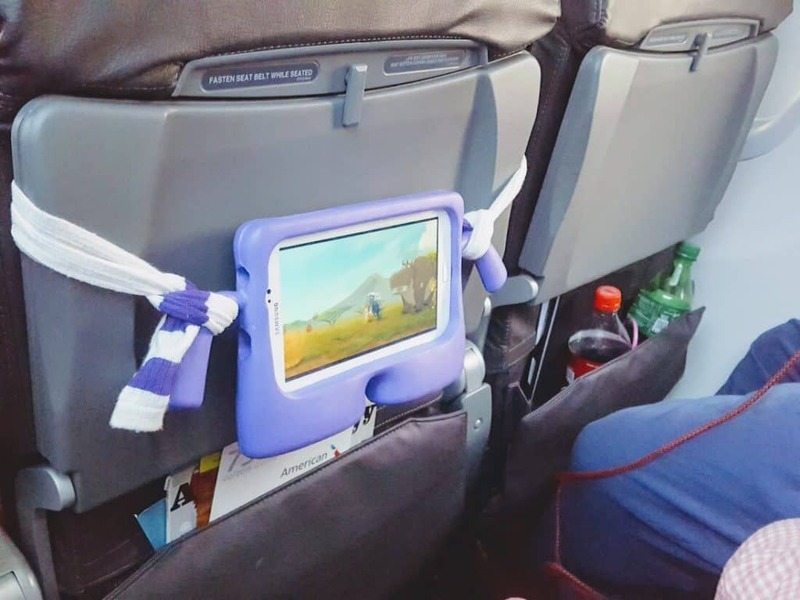 I also had a suspicion that I could rig up a mom hack with the tablet for travel—and I was right! The little arms are the perfect width to tie a string (or in my case, two tall socks) to, and then loop it around a headrest in a car or a closed tray table on a plane. One of the hardest parts of travel for Charlie fairly consistently is the time between boarding and takeoff (since we aren’t moving and she has to stay in her row). The tablet kept her busy the entire time until well after takeoff on our last trip even though she couldn’t have the table down and both situations kept the tablet well out of reach so she couldn’t press buttons. MOM HACK WIN! 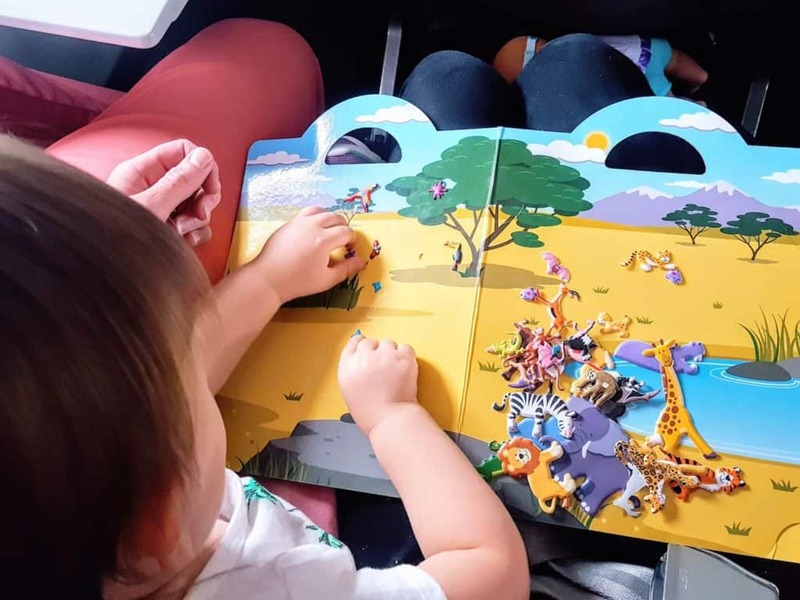 For a long drive for a child who is forward-facing in a car seat (or even for use on an airplane) a car seat play tray is a lifesaver. Car seat trays are designed to give kids a flat area to color, eat, or play on, and helps keep toys, snacks and other items within reach. 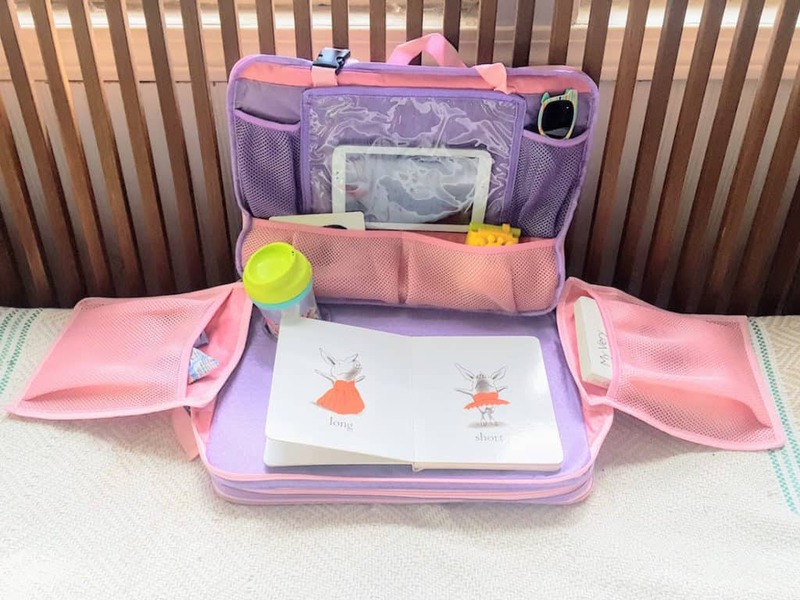 The TravelMe Kids Play Tray, which was sent in exchange for an honest review, is a great example of one! It can be hung from the headrest in front of a child, and has lots of pockets, including a built-in tablet holder for watching movies. 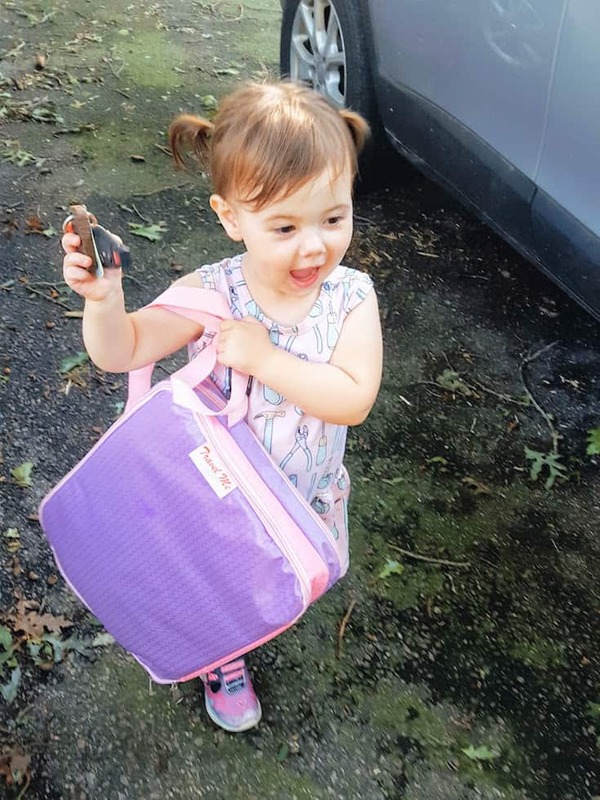 It also zips up into a handy bag with an extendable carrying strap, and has a large zippered pocket for holding all of the child’s items while not in use, making it great for air travel. 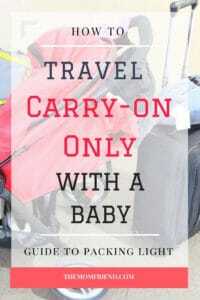 What are you must-haves for traveling with toddlers? Let me know below!